The rebel gun-boat Teaser came down from Richmond to reconnoitre, and had a balloon on board, made of old silk frocks. This she intended to inflate and send up to view our camps at Harrison's Landing. The Maratanza being at the time on picket duty, came upon the Teaser suddenly as both vessels were turning a sharp curve in the river. Of course the Maratanza opened fire on the little rebel, and by a few well-directed shots forced her to surrender. One of the Maratanza 100-pounder rifle-shells exploded directly under the boilers of the Teaser, and came within an ace of blowing her up. Fortunately it did not. only 300 yards wide. Owing to the vigilance of our gun-boats the rebels have been unable to mount any guns on it. "The drawing will show the sudden raids they frequently make, and the desperation with which they fight. 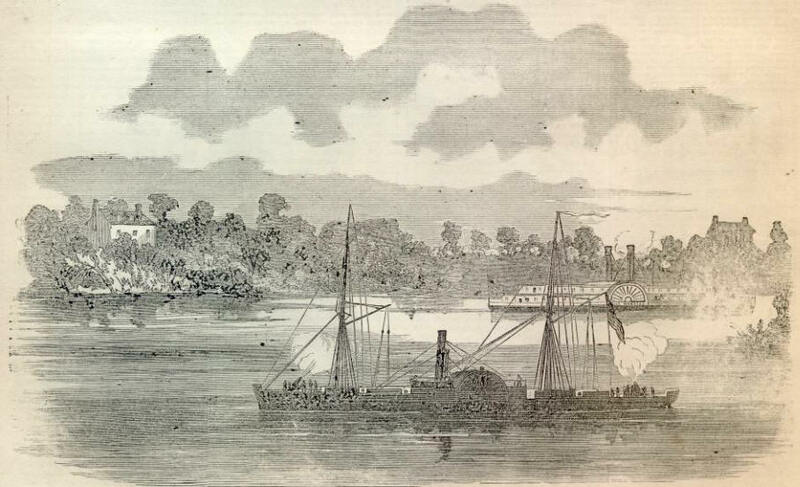 "The Daniel Webster, under a full head of steam, succeeded in running the gauntlet, with much damage done to the boat; but fortunately only one person was hurt—the pilot being slightly wounded in the hand. "The attack was so sudden that before the gun-boat could bring her guns to bear the enemy had swept our decks fore and aft. Having a raking position, they for a while had it all their own way. Fortunately they had too much elevation to their guns, or our loss of life would have been very large; as it was, no one was hurt, although our rigging was cut to pieces, and two or three shots struck us on the quarter. After we got into position we shelled them to their hearts' content, and in a very short time drove them at the double-quick. All vessels now go up and down under convoy. 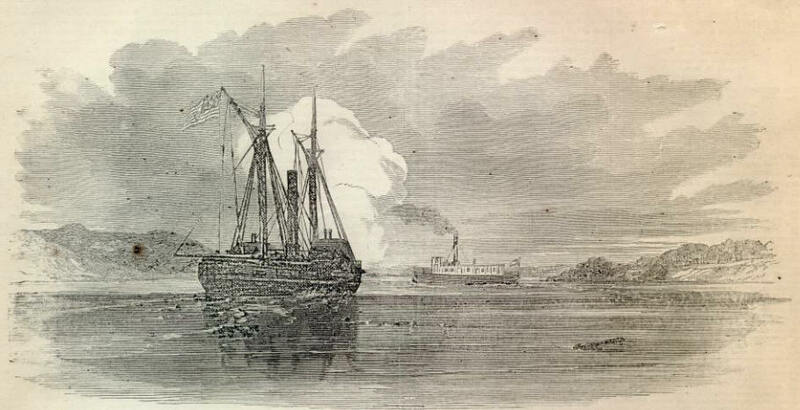 We (the Sebago) remain to take care of the fort, and I hardly think we will again be troubled in this quarter." THE ARMY OF THE POTOMAC. When an aid of General McClellan rode back and reported that the way was all open to James River a thrill of relief ran through the whole line, and the sight of the green fields skirting its banks was indeed an oasis in the terrible desert of suspense and apprehension through which they had passed. The teams were now put upon a lively trot in order to relieve the pressure upon that portion still in the rear. by General Washington during the Revolutionary war. It has a spacious yard shaded by venerable elms and other trees. A fine view of the river can be had from this elevated position. General McClellan expressed the opinion that with a brief time to prepare the position could be held against any force the enemy can bring against us. Exhausted by long watching and fatigue, and covered thickly with the dust of the road over which we had passed, many of the officers threw themselves upon the shady and grassy lawn to rest. The soldiers also, attracted by the shady trees, surrounded the house or bivouacked in the fields near by. General McClellan immediately addressed himself to the task of preparing dispatches for the Government. The transports were already there unloading tons of supplies and fixed ammunition. There are now not less than 600 transports and gun-boats in the river, a large portion of which are at or near Harrison's Landing.